A girl for all seasons: How do I get back to Mullingar? That was the conversation that I had with my class last week, before their three sell-out concerts in Croke Park. It was the truth; I just left out the fact that my niece is 27 years old and really didn’t need me to bring her! What can I say? I’m not a snob about my music. I like and listen to a wide range of tunes, including some of One Direction’s. Also the fact that Niall is a local Mullingar lad gives us an unmerited sense of pride. The last time I got the opportunity to see some Westmeath men play in Croke Park was back in 2004, when we won the Leinster Football Final. I haven’t been there since. So I have to grab every opportunity, however slim. That’s the reason why myself, my sister and her daughter were sitting in the largest crèche in Ireland on Friday evening. We were the only group that didn’t have at least one under 10 girlie in tow. But we didn’t let that phase us. We sang, clapped and cheered along with the rest of them. 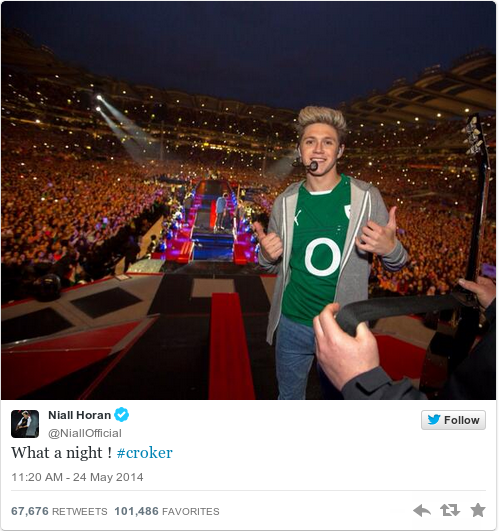 We did draw the line at the ear-piercing screams every time Niall appeared on the screen! Then came time to get out and get home. It must have been a nightmare for the organisers. They would be used to holding music concerts that are normally attended by adults, yet this audience of 80,000 consisted of at least 75% under 10's. Hats off to the ground staff, they were excellent. They got the crowd out in an orderly fashion, no panic, no pushing. So it was that when we exited we were all herded to the left, despite the fact that Roxy was parked in Clonliffe College which was just a few 100 metres to the RIGHT! Being placid people, we followed like sheep. We soon realised that there was no turning back. We stopped and spoke to a nice steward (of which there were plenty). When we explained where we wanted to go, he shook his head and said that he was sorry but we would have to walk around, taking about 45 minutes. It worked! We swam against the tide and arrived back at Roxy in no time. The whole college campus, including the sports fields, was used for parking. There were thousands of cars there, and of course we had been directed all around the area and eventually did the circuit and were parked at the back of the college building which was near the entrance/exit. But if we did the correct thing, we would have had to drive back around the campus, wait for all the other cars to filter out in front of us, which would have taken at least three hours. I saw a car turn in the opposite direction, drive down a little lawn embankment, across a kerb and hey presto! It was on a side road heading straight for the exit! Off we sped, held our collective breaths……and made it. We were on the home stretch. And then we sat….and sat …..and sat. Not thinking she would get through Geraldine rang. Panic! She got straight through to the researcher. We heard her explain. And that’s how we found ourselves on the national airwaves. “Mullingar? I suppose you know Niall?” he asked, a little sarcastically. “Actually I know his mother Maura and his granny,” announced Geraldine proudly. “Really”, he squealed, suddenly getting more interested. Sure by this time we had been exalted to the status of celebrities! We were practically part of the Horan family. We lost the run of ourselves and spilled the beans on how we had exaggerated Lauren’s condition to get back to the car and then we had scooted across a little lawn in order to cut out a few hours queuing. Then we let out a squeal of delight. We moved…….about three metres. Very sheepishly I wound down the window. So it was that after an hour and a prime time slot on national radio we got to the exit, onto the road and then sped home in no time. Certainly a night to remember. Though the next time we might take Niall's advice and use the Sligo-Dublin train that goes through Mullingar.